Coral Reefs, 2017. Available for purchase. CLICK photo above to learn more. My last big series with a nature theme is my Coral Reefs piece. These last three series I wrote about inspired me to offer custom EcoMemory art for people to remind them of their favorite places in nature. It is basically what I was creating for myself with the Clouds, Forest, and Coral Reef series. Part of my studio time this Fall will be dedicated to creating custom EcoMemory art for the holiday season. As one of my customers said, a work of art that is designed specifically for you is a very personal gift for yourself or for a loved one. Click HERE to learn more about my EcoMemory process of interviewing the client, writing an EcoMemory report explaining the design and colors, and the final artworks. My summer sabbatical is ending and I am getting back into the studio again. So look for updates next week. Last week, I started a new series called Coral Reef, Lizard island. The inspiration for this idea is a documentary on Netflix called Chasing Coral. 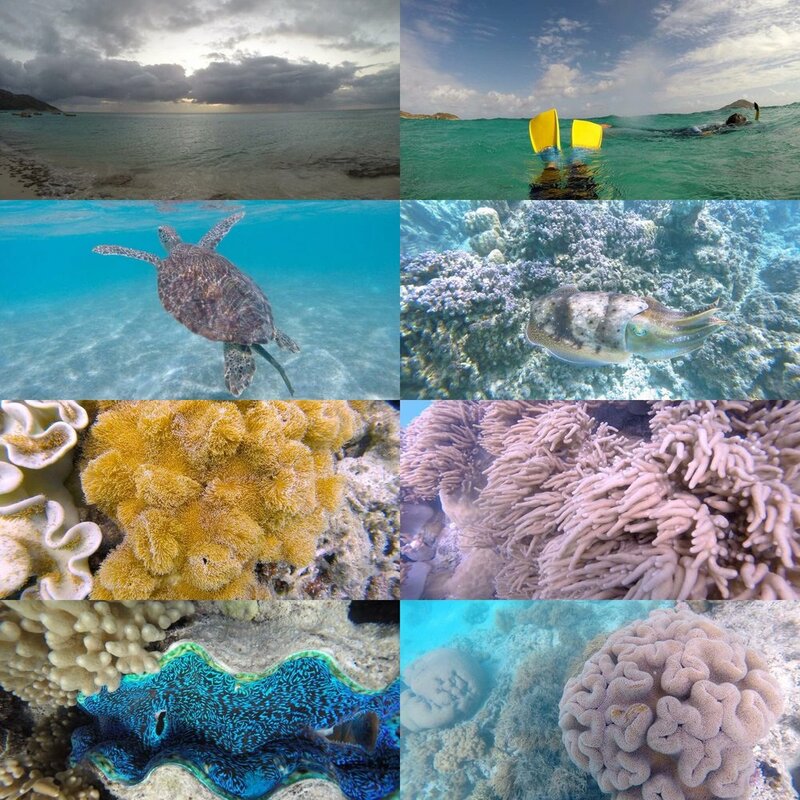 Collage of images taken by our daughter at Lizard Island, 2014. Turtles and cuttlefish are her favorites in the second row down. The documentary tagline from their website is... "Divers, scientists and photographers around the world mount an epic underwater campaign to document the disappearance of coral reefs." I highly recommend this documentary. You can see a trailer in the link above. It is powerful. You see people who love and study coral reefs documenting the effects of warmer ocean temperatures. This documentary hits close to home. The last part of the documentary was filmed at Lizard Island, a research station on the Great Barrier Reef off of Australia. Our daughter spent 10 days on Lizard Island in 2014, the year before the coral bleaching events that occurred in just 30 days and are documented in this film. Watching her see the damage done to a place that she loves was heart breaking. A significant portion of the coral died, along with the ecosystem that relies on it. When I decided to write about this series, I asked our daughter, "Why is Lizard Island one of your favorite places?" "Lizard Island is one of my favorite places because it is an isolated island that is very pristine. There are not a lot of humans who live on the island since the only people allowed are researchers that really care for the island. You can tell in how they take care of the island that it is a labor of love. Also it is a remarkable place for seeing unique coral, sea turtles and cuttlefish (two of her favorite animals in the world). There is a huge biodiversity of life. The island is a little oasis in the coral reef that isn’t plagued by eco tourism and is remote so you feel like you are exploring an ancient sea because there are no people. And, of course, it is also beautiful, very colorful." How does it make you feel when you think of Lizard Island? "I feel grateful for being able to see such a beautiful place. I also feel Inspired by the diversity of animals and plants that are there." Coral Reef, Lizard Island series. Day 227 of 2017. October 3, 2017. One of 25 six-inch squares sewn together for the final piece. So I wanted to do an ecosystem series and I knew after watching this documentary that coral reefs would be the first one. I researched the organization involving the Chasing Coral team, The Ocean Agency. I love how they describe themselves and their mission. "The Ocean Agency (formerly known as Underwater Earth) is a not-for-profit organization founded in 2010 by a group of ex-advertising execs and creatives. We believe, above all else, great communication is key to finding solutions. We've allowed the ocean to lose it's magic - we've allowed it to become irrelevant. That needs to change and it needs to change quickly. People can be inspired to act - we're just missing that all important word... inspired. " Then I found out they have an initiative called 50 Reefs where they are focusing on how to solve the problem. 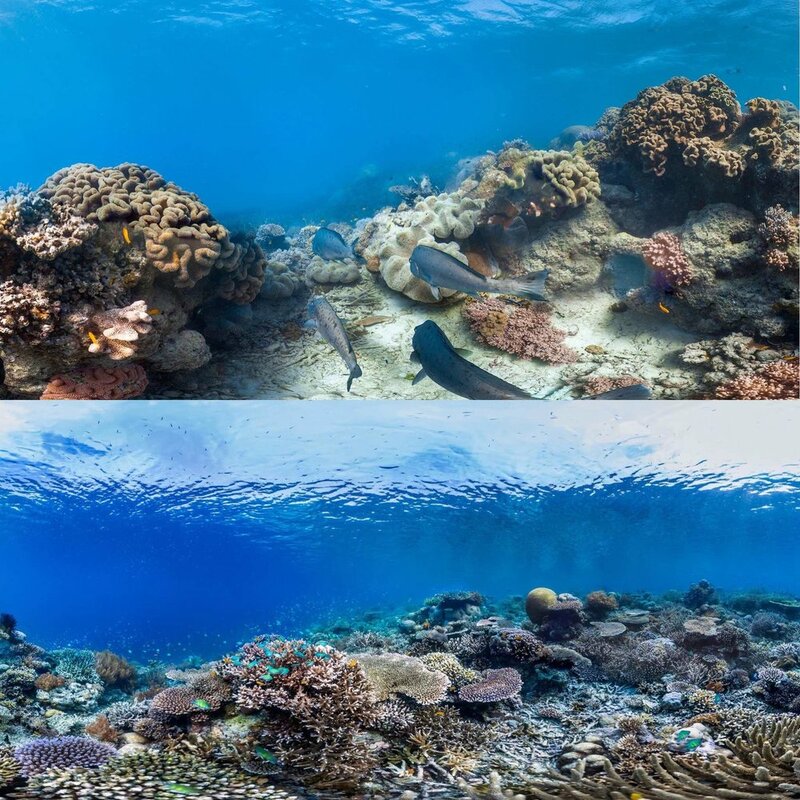 "The 50 Reefs initiative aims to rapidly bolster existing coral reef conservation efforts globally by catalyzing new targeted action and investment in key geographies. It will identify and protect coral reefs that are least vulnerable to climate change, that also have the greatest capacity to repopulate other reefs over time." Now, I was fired up to help connect people to the coral reefs through my art. Art can be a powerful vehicle to tap into people's emotions and inspire them. I do this to honor our daughter and all the people who are inspired by our oceans and all of its inhabitants. I went about planning this series in my usual way, deciding the color palette and the design parameters. My color palette is based off of images at Lizard Island. I have 3 different shades of blue for the water on the top row of the final piece, tan for the sand on the bottom row with various shades of purple, coral, orange and yellow to depict the coral itself. To be true to the images, I held up my fabric to the images to match as closely as possible. My design for this series is different in that I am providing a scene for a real place. Usually my work is more on the abstract side but I wanted to give the feeling of the water above and sand below which really struck me in all the images. The coral reef part in the middle will be vertical strips of the different corals colors. When seen all together, it will be like one large healthy coral reef full of diversity. I want this series to be a tribute to all the people who care about our oceans and the work that 50 Reefs is doing to protect our oceans and coral reefs.